In the debates over The Lone Ranger, we frequently hear that Depp is just an actor, not a writer or costume designer. In other words, that his job was merely to carry out the Tonto role given to him. Depp's Tonto equal partner, not sidekick, of 'The Lone Ranger'Depp’s interest in playing Tonto in “The Lone Ranger” developed early on when it was just germinating as an idea with producer Jerry Bruckheimer. 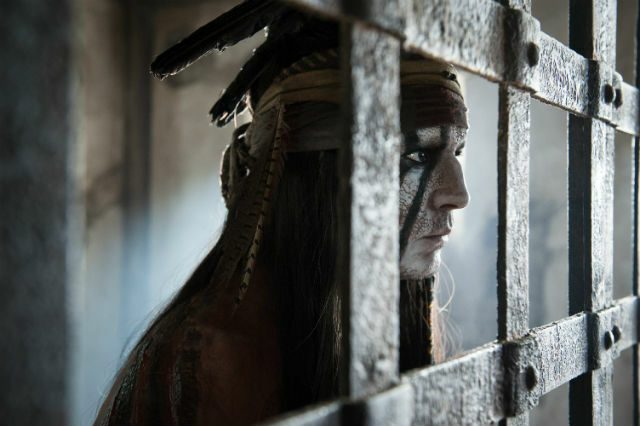 Depp, in typical fashion, figured that the best way to get the ball rolling would be to get into character as Tonto. He enlisted the help of two close friends—makeup artist Joel Harlow and photographer Peter Mountain—and set about creating his distinctive version of how Tonto would look in the hope that it would convince Bruckheimer and the studio, Disney, to give it the green light. Depp is, of course, a master of disguise and a brilliant character actor as well as one of Hollywood’s best-loved leading men. He based his ‘look’ for Tonto on a painting he’d seen of a Native American warrior and added his own, unique, flourishes. The result was spectacular and it convinced Bruckheimer—and indeed Disney Studios—that it was time for “The Lone Ranger” and Tonto to ride back onto the screen. As Bruckheimer relates, “Johnny Depp creates amazing characters, no matter what movie he’s in. His Tonto will be different than any Tonto you’ve ever seen before. He has a whole different look, a whole different feel. We don’t even know until the cameras roll what he’s going to do, but we know it’s going to be entertaining and very interesting.”Comment: Wow. This article confirms that Depp created the crow-head look before the movie was greenlit, and this radical re-imagining convinced Disney to proceed. Depp is 100% responsible for this stupid Tonto. Also note what this says about the so-called Comanche advisers. They're told Disney greenlit this movie primarily because of Depp's fabricated Tonto look. Their choice is 1) approve the look and receive fame and glory as Friends of Johnny, or 2) disapprove the look and be labeled the villains who destroyed a $250 million movie. Wow, tough choice...not. The vast majority of the population would choose 1) regardless of the facts of the situation. So we can pretty much ignore everything the advisers said years after Depp invented his phony Tonto. For more on Johnny Depp, see Lone Ranger Pitch Meeting, Critics Agree: Lone Ranger Is Bad and New Tonto as Racist as Old Tonto. This is one for the ages, Rob. You are going to be mining this one for stereotype, pop culture, etc material and examples for many years to come. A landmark, or lowmark. Take a way Depp, and it looked awful as well. At least from the trailers. It was really Bruckheimered-up, and it appears the vision of the Old West was one in which everything was desert. And everything that wasn't desert... from horses, to railroad watertowers, to saloons, to watering troughs....was packed to the gills with TNT waiting to go up like a rear-ended Ford Pinto. The only thing that looked good to me was the logo, that merged the mask with the headbird. But even that was lame... because it used Depp's headbird. I trust this issue will die down in a week or two. But with Depp claiming he wants to buy Wounded Knee, it may go on for weeks. But yes, Depp's role will be a perennial reminder of Hollywood's shortsightedness. People will forever compare it to John Wayne playing Genghis Khan or Iron Eyes Cody playing an Indian. The local "Subway" restaurant still has a life-size ridiculous birdhead Depp standee near the entrance. Pat yourself on the back there, Rob. You called it all the way, including your in depth discussion about how Depp's "star power" is really rather weak.
" But with Depp claiming he wants to buy Wounded Knee, it may go on for weeks." Also, I'm not sure to trust him on this. Say, if he promises to "give it back to the tribe". Who is the tribe, according to Depp? He's a real Comanche...just ask him. He could choose to give the Wounded Knee land to Indians just as real as himself: Ward Churchill, Benicio Del Toro... hmmm..... just watch, Justin Beiber will end up owning it.